The food safety is paramount and hence the equipment used in the food processing too, overlooking on the quality of the same has high potential to lead contamination caused by the pathogenic microorganisms (bacteria), which is the major cause of food borne illness and therefore emphasis on the hygienic during the production process is obligatory from the perspective of human safety, brand value and legal obligation. In the food industries, a conveyor belt is a very common part of the food processing, which directly contact food and hence is also a major area of concern while selecting. We manufacturer of the conveyor belt comprehend the requirement of the food safety and hence have engineered by combining non toxic, non porous, chemical resistant and FDA approved material to the highest standards that do not react with the food at the high temperature or very low temperature and also does not carry odour or colour to the conveyor food, whereas the nonporous structure of the rubber prevents the accumulation of the bacteria and growth of the same, is a considerable advantage of our food grade conveyor belt that promises for the ultimate hygiene and food safety all through the process. Further, the non sticky surface of our food grade belt is easy to clean and hence increase the efficiency of thereof. The PU and PVC material used in the construction of the food grade conveyor belt is proven to be excellent suitability against non oil/acidic/reactive materials, high moisture and high temperature and hence is extensively being used for every type of foods without any doubt of contamination. Our food grade conveyor belt is extensively used by the consumers associated with fruit, vegetable, meat, sugar, salt, confectionery, seafood, poultry, tobacco, grain, pharmaceuticals, tea, cheese processing, butter processing and bakery segments and also applauded for its incredible performance throughout. We have developed the broadest chain of the food grade conveyor belts to serve every food industry with the best suited one. By means of the wide-ranging experience in the different food products, we food grade conveyor belt manufacturer is qualified to engineer the best in class quality food grade conveyor that can be the best bet for your food conveying requirement. No matter what size and type of food grade conveyor belt, you are seeking, we can custom made to your specifications without compromising the food grade quality of thereof. 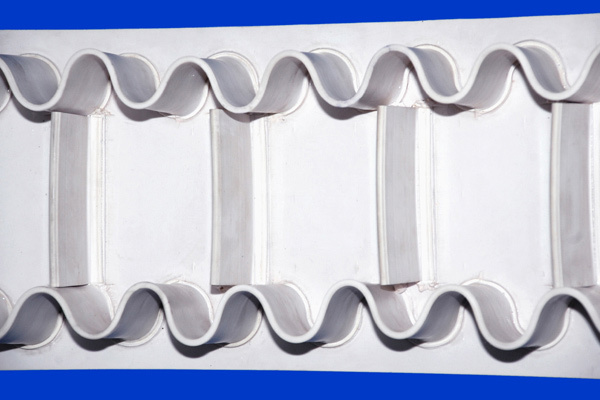 Our each and every PU/ PVC conveyor belt is FDA/USDA compliant and a long term affair for your food conveying requirements, also available with the sealed edges, cleats, side walls and guides at the best possible rates in the market.